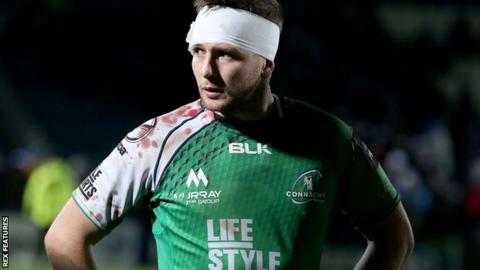 Connacht picked up a third win in three European Challenge Cup matches with victory against Newcastle. Fly-half Jack Carty kicked 20 points for the hosts in Galway, who top Pool One at the halfway stage in the group. Replacement centre Danie Poolman crossed for a try with six minutes remaining to deny Newcastle a chance to claim a losing bonus point. Captain Richard Mayhew bagged a second-half try for the visitors, but two points was as close as Newcastle got. Carty's kicking ensured Connacht led throughout and the 23-year-old missed just one attempt from seven on the night. The defeat leaves Newcastle second in the pool with third-placed Brive playing Russian side Enisei-STM on Saturday. Connacht: O'Halloran (capt); Adeolokun, Parata, Robb, Healy; Carty, Blade, Bealham, Harris-Wright, White, Dillane, Muldowney, O'Brien, Connolly, Naoupu. Replacements: Delahunt, O'Donnell, Ah You, Qualter, Heffernan, Porter, O'Leary, Poolman. Newcastle Falcons: Hammersley; Marshall, Penny, Harris, Kibirige; Willis, Takulua, Rogers, Lawson, Vea, Witty, Botha, Mayhew (capt), Temm, Hogg. Replacements: Hawkins, Harris, Foster, Green, Chick, Dawson, Socino, Watson.